Parade 2009 has as array of lodging selections within the Keystone Village. Free shuttle service will be running constantly throughout the resort area the entire week of Parade. This lodging map will assist you in your selection of an area. Please keep in mind during your selection, the free shuttle service. West Keystone Condominium area is located along Keystone Rd. This road leads to the Concours site at the Keystone Ranch Golf Course. The Keystone Lodge, as well as a choice of numerous Condominiums is located in the Conference Village area. 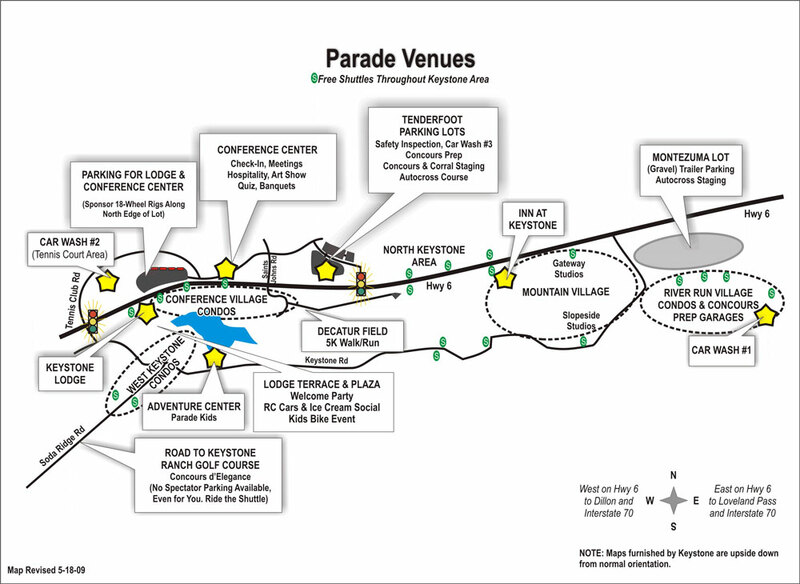 They are all within a 5-10 minute walk of the Conference Center or “Parade Central” where most Parade activities will be centered. The Lodge contains restaurants, a deli and a bar. The Welcome Party will take place at the Lodge’s lakeside terrace and flow out around the beautiful Keystone Lake. Moving along Hwy 6, we also have a block of hotel rooms at the Inn at Keystone, in the Mountain Village area. Note: the Inn at Keystone is the only pet friendly lodging in the area and must be arranged for ahead of your arrival. No pets can be allowed in the Conference Center or “Parade Central”. The River Run Condominiums, in the River Run Village area. You will have covered and underground parking, we recommend this area to Concours entrants, as well as others who may want to choose this active spot. We have arranged for electrical outlets for those needing lighting to prep Concours entry cars. This prep area is located in the Silver Mill and Buffalo Lodge condo garage. The River Run area also features a number of restaurants, bars, and small shops. “The Springs” condo is a great selection if you have Parade kids along. As at past Parades, participants will be able to reserve lodging after successfully completing registration. Contact information and an authorization code will be provided with your Parade Registration confirmation. The negotiated lodging rates shown on the lodging tables will be available from March 3 through May 27 when reservations are made with the Parade Registration pass code. With the pass code, the rates shown will continue beyond May 27 if rooms remain in the contracted room block. However, availability is not guaranteed after May 27 and rates may change. Access to the Parade room block will be denied without the Parade Registration pass code.